This is one of the popular cams on Opentopia, Chip-Chan’s Apartment, and one that often gives rise to a lot of concerned discussion. 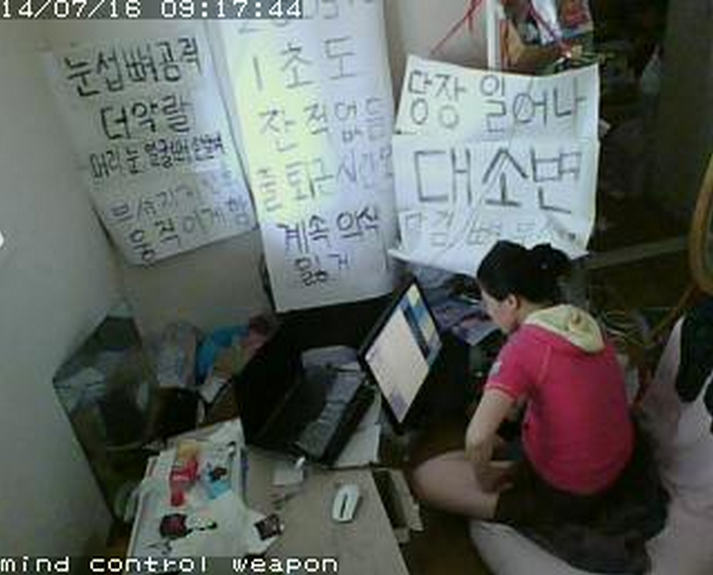 It is looking into the apartment of Chip-Chan, a woman in her thirties who lives in South Korea. She spends most of her time in view of the cameras, sleeping or eating or on the computer. She sometimes does strange things like walking around in disguise or hanging up signs. First of all, don’t worry, we’re not snooping on her against her will. She put up the cameras herself, and invites people to visit them, and the messages she hangs up are for the viewers. Not that it all makes a lot of sense, because she’s kind of crazy. It would probably be reasonable to say that she has a mental disorder. She believes that the police installed a chip in her ankle, which forces her to have a weird sleep schedule and do other strange things. Chip-Chan is quite famous across the internets. People write blogs and wikis about her. She even writes several blogs herself. Here is one. She’s asking for help. Unfortunately it seems that nobody’s found a good way of helping her. And she’s asking that if one can’t help her, at least spread her story. Not that it helps very much, as it doesn’t make a whole lot of sense.